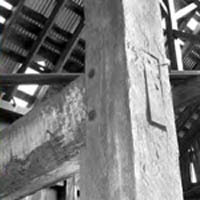 Example of mortise and tenon joinery inside the hay barn, common in 19th century New England construction but rare in California. A simulation of what the reconstructed structural framing would look like. 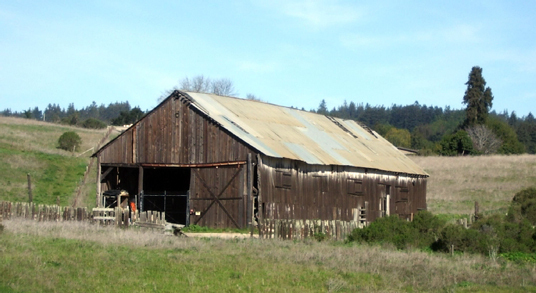 The historic Cowell Ranch Hay Barn at UC Santa Cruz, dating back to the late 1800s, will be reinvented as the centerpiece of a revived campus entrance and new home for many of UCSC's innovative environmental sustainability programs. 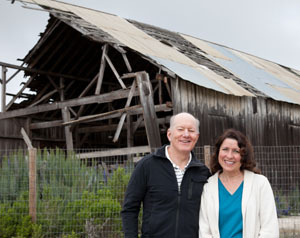 The re-use plan is part of a multi-year project made possible by a $5 million gift from the Helen and Will Webster Foundation to create a focal point for environmental programs adjacent to the UCSC Farm on the southern portion of the campus. "UC Santa Cruz is a pioneer in the fields of environmental stewardship and agroecology," said Chancellor George Blumenthal. "This very generous gift enables us to continue to build on these programs. Even the process of rehabilitation epitomizes UCSC's focus on sustainability, environmental stewardship, and hands-on learning," Blumenthal said. "I want to thank the Webster Foundation for its vision and generosity." The gift includes $2 million to support programs and activities in environmental studies. "The Division of Social Sciences is incredibly grateful to the Webster Foundation," said Social Sciences Dean Sheldon Kamieniecki. "The allocation of these funds, along with support from the campus and the division, represents a major first step toward realizing the Webster Foundation's vision for reviving the important historic area in the south campus. Many faculty and students will significantly benefit from various academic programs funded by this award as well." Restoration will be a working history lesson and an example of UCSC's commitment to sustainability, both in how the barn is redone – including reusing wood – and how it is put to use. "The Farm and the entire south campus complex of historic buildings is the gem of the UC system," said Webster Foundation trustee Alec Webster, a UCSC alumnus (College Eight, 2002, Environmental Studies). "We see it as a place for people to gather, celebrate, learn, and hope it will inspire other private donors to join the project." The Webster Foundation gift is among the largest single gifts to UC Santa Cruz and is part of a university-wide effort to increase investment in UCSC's people and programs. The 4,800-square-foot hay barn first rose on the Henry Cowell Ranch in the late 1860s and has suffered from the fates of time. Plans call for dismantling the structure and reusing as much existing material as possible. Construction will begin in a year with occupancy expected in September 2015 – during the campus's 50th anniversary year. The barn is within the 32-acre Cowell Lime Works Historic District listed on the National Register of Historic Places. Its massive timber framework was constructed nearly 150 years ago by hand using the art of mortise and tenon joinery with wooden pegs, common in New England but not in California. The barn's age makes it a rare survivor of this type and vintage of construction. "It's incredible craftsmanship," Webster said. "The hay barn renovation is an opportunity to do several things all at once," said Daniel Press, UCSC environmental studies professor and executive director of the campus's Center for Agroecology and Sustainable Food Systems, who is overseeing the project. "It's an opportunity to honor a historic construction method and provide an attractive, well-situated welcome to the campus, the farm, and historic district," he said. "It can become a focal point for the thousands of students who visit the farm every year." UCSC's many outstanding environmental programs include CASFS, Life Lab for grade-school children, Sustainable Living Center, Program in Community and Agriculture, Environmental Studies department, and Arboretum, each centered in different places on campus. "There are so many uses," Webster said. "It's the biggest and best laboratory the campus has. We want the community to join us to celebrate the history that is here and build for the future." Planners held a workshop last summer to develop a shared vision for a newly rebuilt hay barn to support CASFS operations including work spaces and meeting rooms, and allow for use by Life Lab participants, farm visitors, and for events. Included are large flexible spaces for small conferences, lectures, or workshops that will allow the greater UCSC community to use the space as well. A feasibility study by historic preservation specialists Garavaglia Architecture of San Francisco suggested a phased approach to reconstruction. The first stage would be to deconstruct and catalog historic pieces of the building and rebuild a weather-tight shell on the same site, using the vintage timber-joining techniques. A recommended second stage will add interior improvements, making the structure suitable for exhibitions and meetings. In the 1860s and '70s, the Cowell Ranch was the center of the largest lime manufacturing operation in California. Lime was a vital building material at the time and played a key role in the development of California cities after the Gold Rush. "The barn was critical to shipping lime to market," said Frank Perry, president of the Friends of the Cowell Lime Works Historic District. "It sheltered the oxen that pulled the wagons of lime to the wharf and stored fuel (in the form of hay) for the oxen." "That's our history; that's the history of the campus," Webster said. "If you don't know where you came from, how are you going to know where you're going." The Helen and Will Webster Foundation is a private family foundation based in Pasadena and committed to education.